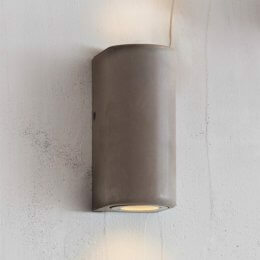 The Concrete Outdoor Wall Light is a wonderful mix of industrial materials and can be used outside or in. It has a water pipe style satin nickel arm for a look that is stylish but timeless. 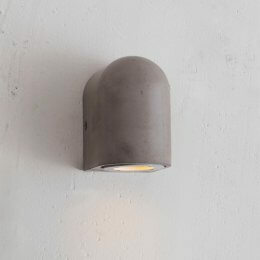 Shade and backplate made from Polymer Concrete, the material has been left raw and unpolished leaving the natural markings visible. 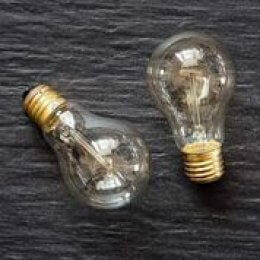 The fitting is designed with an E27 lamp holder which is encased by a glass shade, ensuring the bulb is kept safe from the elements. 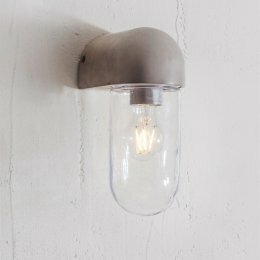 See also Concrete Outdoor Wall Down Light.